After tabulating your survey answers from yesterday, it was pretty obvious that most of you were most interested in seeing a limited edition collection as my giveaway prize. Well, ask and ye shall receive! 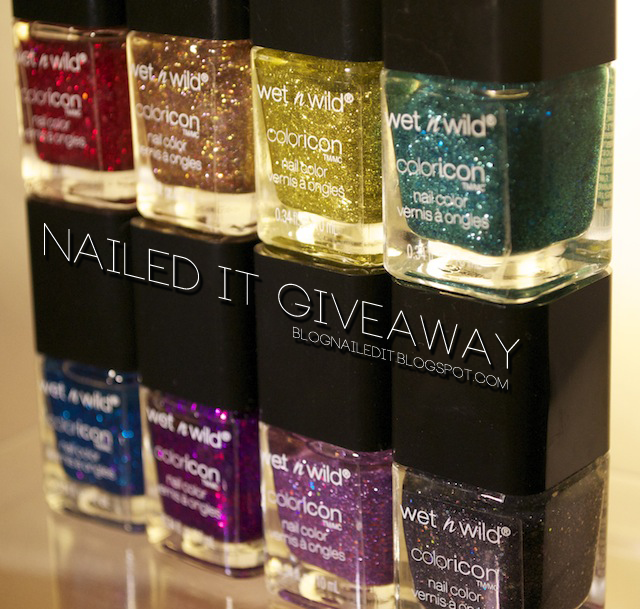 To celebrate my 500 Blogger reader milestone, I'm offering everyone who follows my nail art (whether on Blogger, Tumblr, Twitter, Facebook, or Pinterest) the chance to win the Wet n' Wild Color Icon Ice Baby Holiday 2011 collection! 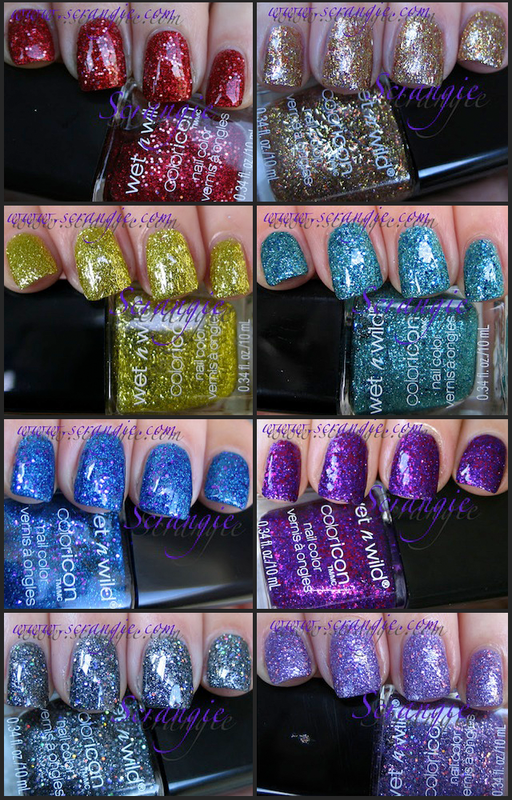 This collection consists of 8 super-snazzy glitters in all colors of the rainbow. There's a few bar glitters, and some serious bling in each bottle. This collection is no longer available in stores. I'm opening this up to international followers as well this time, hoping the cost of shipping isn't completely outrageous if someone international does win. If you do win, and you are living overseas somewhere, bare with me when it comes time to deliver your prize. It may be tricky. I'm also opening this up to any readers who have enjoyed my nail art through any of the 5 social outlets I use: Blogger, Twitter, Tumblr, Facebook and Pinterest. You only need to be a part of one of these outlets to be entered to win, and it doesn't have to be through Blogger. I'm celebrating everyone who has ever read or looked at my nail art. Good luck, and please don't hesitate to ask any questions you may have so we can ensure your entry is properly counted. All entries will be counted using the Rafflecopter Widget below. Now who wants to see some swatches, courtesy of Scrangie? All of these swatches were done by Scrangie at www.scrangie.com. I simple compiled her pictures from this post into one graphic. Definitely a collection I hope to win. Good luck everyone! Congrats on your 500+ readers :D So exciting!! These polishes look amazing! Hey! I definetly signed up for the chance to win. But did I do it right? All it asked me was to follow you on certain areas, and I hit yes for Facebook and Twitter. Was that all I needed to do? As long as you actually liked my Facebook page and are following me on Twitter using the username you entered into the Rafflecopter, yes! If you want me to check your specific names for validity, send me an email with the names you entered with. Ooo, exciting! I have one of these colours, but not the rest, and they all look great! Love your blog! First time in contest for giveaway! OMG so happy to try to win! Tks!! :) I love it!